NBC has a lot of faith in their new This Is Us TV show. The peacock network has just renewed the popular drama series for not only a second season, but a third season as well. The network has committed to producing at least 18 episodes apiece for seasons two and three. UNIVERSAL CITY, Calif. — Jan. 18, 2017 — To the delight of a massive and passionate fan base, NBC has ordered two minimum 18-episode seasons of its Tuesday night drama sensation “This Is Us.” The Pearson family will be spending a few more birthdays with NBC. 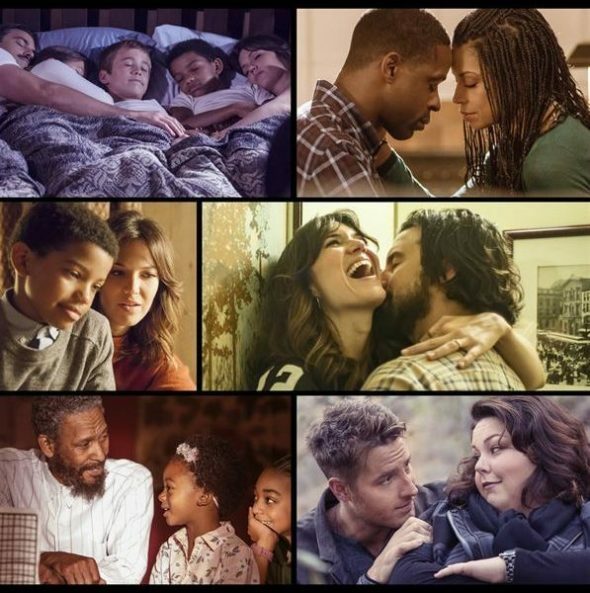 So far this season, “This Is Us” originals are averaging a 4.6 rating in adults 18-49 and 14.6 million viewers overall in “live plus seven day” results from Nielsen Media Research, making it the #1 new show of the season in 18-49 and television’s #4 entertainment series in that key demographic. It returned to the schedule this last week after a five-week break and set a new “live plus same day” series record in adults 18-49 (3.0 rating). This episode also set a new series record in L+3 (18-49) with a 4.6 rating, delivering NBC’s top rating in the timeslot with scripted programming since April 2008. To date, 72 million total viewers have viewed the first 10 episodes in some fashion on all platforms. Linear viewership plus views on all devices of the pilot episode since Sept. 20 stands at an estimated 10.0 rating in the 18-49 demo. The show to date is averaging an estimated 8.3 rating in 18-49 most current data (includes long-tail viewing through various number of days available per episode, i.e. 114 days for the pilot, 107 days for episode 2, etc.). On digital platforms, “This Is Us” is NBC’s most-viewed series premiere on record, more than doubling the network’s previous record for most one-day views of a debuting series across NBC digital platforms. “This Is Us” was also the most anticipated new series heading into fall with its trailer viewed more than 105 million times following the show’s announcement at the May upfronts. “This Is Us” is a refreshingly honest and provocative series that follows a unique ensemble whose paths cross and their life stories intertwine in curious ways. We find several of them share the same birthday, and so much more than anyone would expect. “This Is Us” is a smart, modern series that will challenge your everyday presumptions about the people you think you know. What do you think? Do you like the This Is Us TV show on NBC? Are you glad that it’s been renewed for two more seasons? Or, do you think that it should have been cancelled instead? The Days and Nights of Molly Dodd: Why Isn’t the Blair Brown Series Available? I am looking forward to Seasons 2 and 3! This show is a great departure from all the reality series that seem to rule Primetime. The characters are easy to relate to, and I find myself glued to the television from start to finish. I have yet to watch an episode without shedding a tear or three (more like a bucket!). Truly magnificent storytelling with an all around talented cast. Haven’t seen a show like this in forever. I feel like I know all the characters and every episode has you taking a look at your own life and being glad you’ve added this show to your watch list. Finally, something real. Thanks NBC for bringing back your A game. I love it! I’m hooked. I love the show!!! Can’t wait for it to continue. I absolutely love this show. The actors are extremely talented and the writing and directing is phenomenal. I really enjoy this show and want to see more. I enjoy this show and want to see more. Absolutely love this show and never want it to end!!! I couldn’t wait to get home every Tuesday Tuesday night Tuesday night to watch. T.I.U. When I saw tonight’s show the ending made me mad. I didn’t get to see what happened to Jack. My cousin yelled at e T.V. Go after him she said. So I Google so,e info and discovered this. Oh yes 1 more seasons. Make it 3. By far the best drama series we have seen in YEARS ! We look forward to it every Tuesday as the highlight of our week . It reminded us of ROOTS how we became rooted to our TV,although it’s humanity is more personally poignant and gripping ! We are in our 70s and not mentioned in your Nielsen ratings …..that shows you the grip this series had on all ages ! We can not wait for season two and three and hopefully more ! I think this show may well go down as one of the best tv shows of all time in history. Every single episode of season 1 was emotional (I cried – no, I bawled – every single episode), deep, heartwarming, insightful, and funny. The consistency and quality of the writing, storylines, and acting were astounding. Loved the first season! Can’t wait for the second season. I love this show!! The cast is fantastic & I love the flashbacks from then & now. I can’t wait for Season 2 & 3, please hurry!!!!! The absolute best!! I can’t wait for the next season. Please start season 2 ASAP! !